Shortening the cold, dark north European winter is becoming an ever more important objective for me and despite a January trip to Burma, I was getting desperate for some sustained good weather by the end of February. 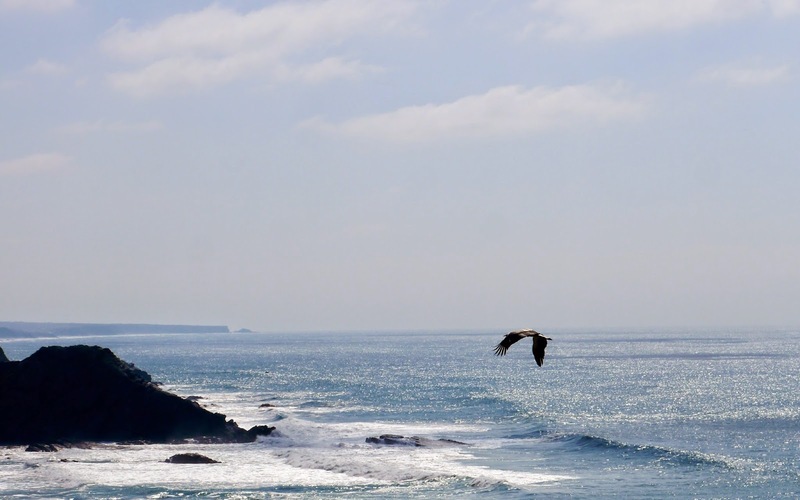 I couldn't afford another long haul trip and after looking at its excellent website, the Rota Vicentina in SW Portugal seemed like the ideal alternative. The total network - which includes the Historical Way and the Fishermen's Trail - includes some 350km of walking and if you don't have the time to do the whole thing, a variety of different itineraries can be put together. It's a new trail, has only been established for three years, but is already attracting a lot of walkers with several companies, including Inntravel, promoting it. The website provides detailed trip notes, GPS trails and information on accommodation and using it to put together a trip couldn't be easier. I started my walk on the 11th of March at the northern end of the Fishermen's trail and finished at the Cabo de San Vicente 9 days later. 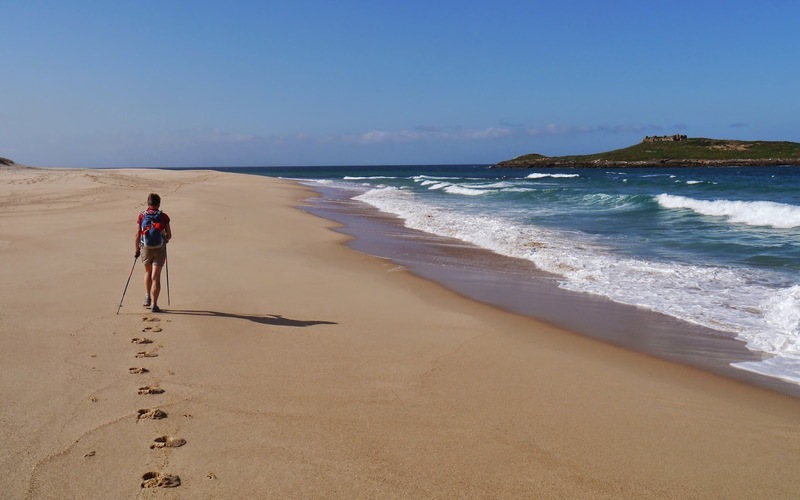 Based on my experience the Rota Vicentina is a really good easy season walking destination and I enjoyed great weather, particularly for the first 4 days along the Fishermen's trail. SW Portugal has mild winters and in February, March and April the sun shines on average nearly 8 hours a day. It does rain, but not that much and the wettest months are November and December. 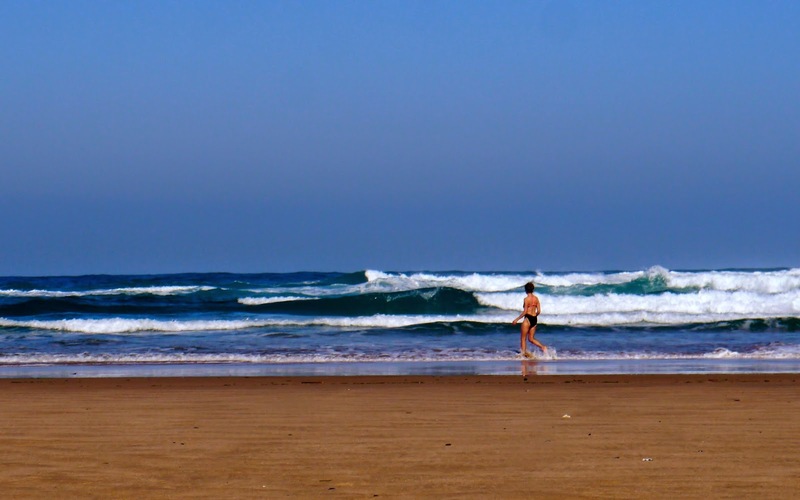 It can be warm, almost typical English summer weather and indeed sea temperatures off the coast are similar to those found in the North Sea in June/July. 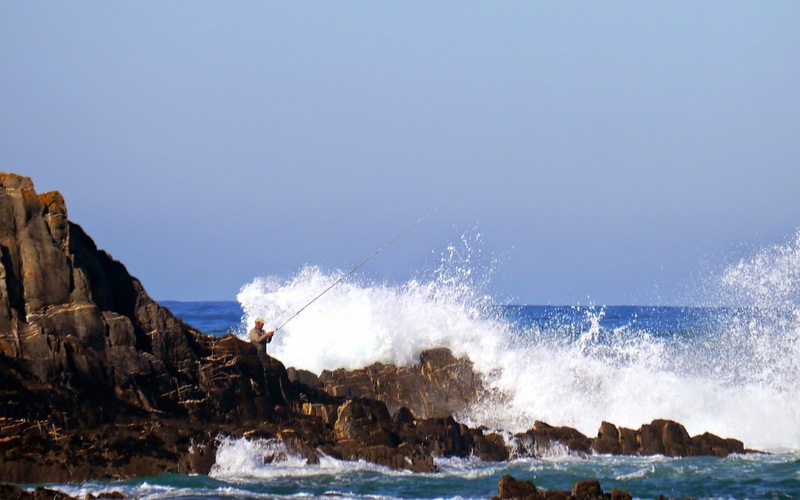 The best walking was the Fishermen's Trail, which run's along the coast for four days from Porto Covo to Odeceixe and then as a series of add-ons to the Historical Way as it heads south to Cabo de San Vicente. This is an excellent stretch of coastal walking and compares well, for example, with the Pembrokeshore Coastal Path. 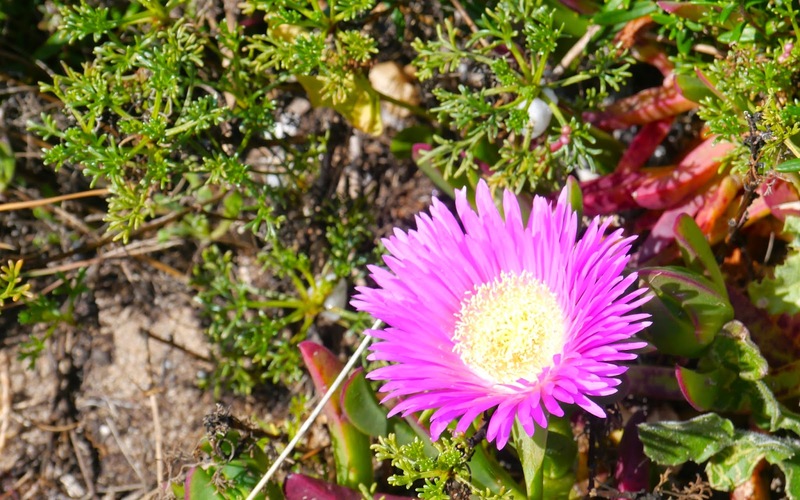 Much of the walk is along cliff tops, made up of stunning multi-coloured rocks, and the views up and down the coast are spectacular. Occasionally the route drops down to the beach and if you're used to swimming off the UK coast you might even be tempted into the water. Away from the coast the scenery is not as impressive. 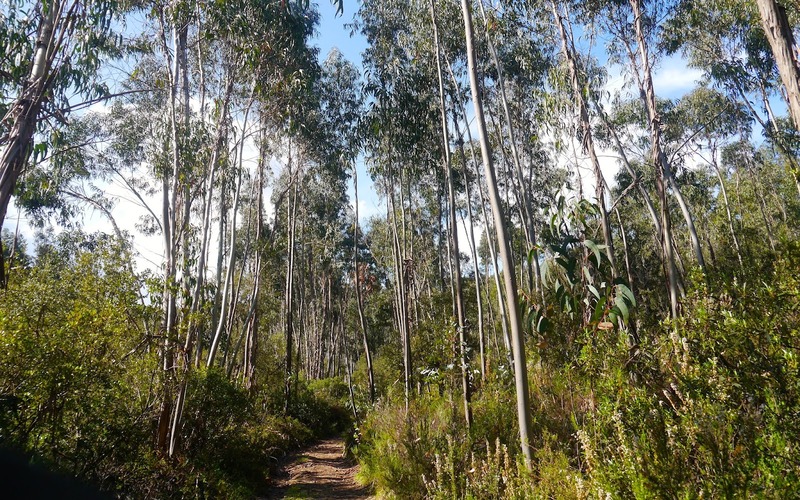 Fairly flat it mixes sandy heath land with pine, evergreen oak (including cork oak) and even eucalyptus forest and can be just a little dull. It is a good trail, however, involves very little road walking and passing through the SW Alentejo and Vicentina Natural Park is very quiet. The flowers were particularly impressive all along the route and even in March created a spectacular multi-coloured display. Apparently they get even better and the perfect time to experience them is towards the end of April, beginning of May. Also impressive, particularly along the cliff tops was the bird life. I've seen lots of storks nesting on chimneys and churches in Spain, but here the sites are more natural, typically on rock stacks located defensively away from the main cliff face and from where the huge birds launched themselves into graceful, wind assisted flying displays. The Rota Vicentina is very easy and accessible walk, well defined and marked and with few significant ascents. In places, however, it is sandy and although generally speaking, it's easy to beat the times suggested on the website, the sand will slow you down. Accommodation is plentiful, comes in a variety of shapes and sizes and is as good value as it is in Spain. Food and wine are also very good, although beware portions can be enormous in Portugal and sometimes it makes sense to share a plate. If you like good seafood, then you will enjoy the food on the Rota Vicentina. One thing that did surprise me was how popular the walk was. It's a nice walk, but part of its attraction must be the fact that it's accessible so early in the year. If you want to walk in the sun, out of the snow, in February or March, and you like good food and wine, then SW Portugal is one of the few places to go in Europe. The trip looks great. Just out of curiousity, how crowded was the lodging? I was thinking about making the trip but might want to do two stages some days. So I'm reluctant to make reseravations ahead of time. Any thoughts? I also thought about bringing an ultralight tarp for a bivouac, but everything I've read says that is not allowed. When I went March it wasn't crowded and there was quite a lot of it. On camping if its the same as Spain camping near the beach is frowned upon but a blind eye is turned to it elsewhere. Usual rules of thumb I guess, away from houses and camp late and leave early. Good to know about lodging and that's about what I expected in terms of camping. Thanks! What footwear would you recommend for this trail? Walking boots, trainers and/or sandals? I've never hiked on sand before over a long distance and I'm not sure what the best method is. Does the hardest terrain here warrant walking boots? I'm not a fan of walking boots I'm afraid but for this route in particular trainers are fine. I'm a fan of Inov8s - fell running trainers which are very comfortable and very light. To be honest I don't now how crowded things are in July. Some of the places I stopped at were quite small with limited accommodation so I guess it could be a risk. The official website, mentioned in my blog, does have a list of accommodation, including some budget options, so it might be worth asking them the same question. Hi John, I was hoping to do the Fisherman route in late June. How easy would it be to walk into the city and find a hostel or budget guesthouse without knowing where one was located beforehand? Thanks! Some of the places on the route are a little limited in terms of number of guest houses and could be full as the holiday season approaches. I would at least check out how many options there are before I go. Also I like to know where a place is at the day's end, can be frustrating trying to find a place when you're tired. 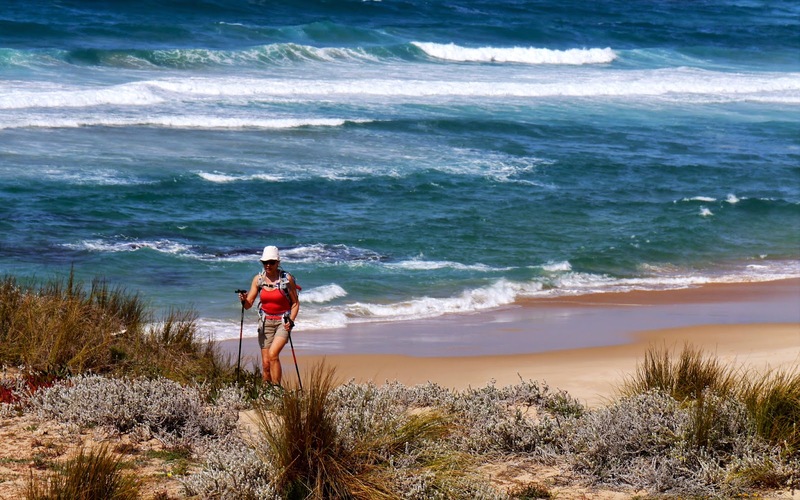 -how can you reach the beginning of the trail and at the end how is connected cabo do sao vicente to other cities? -do you think this is a safe trip for a lonely woman? -how trained have you to be to do it? Hey John, I just found your website. It's excellent. just wondering what gear you brought for rota vicentina trip.i'll be heading off at the start of march. Thanks for your kind comment. On gear nothing special really. It's not cold in this part of world, waterproofs are good but hopefully it won't be wet, and light weight boots or trainers. I wore trainers and they were fine. Hope that helps. Thanks for getting back so promptly. Really looking forward to this short break. Will be checking out your 'dream way' guide when i get back.physically i feel i could handle it but just concerned about the cables etc to keep me from falling.Just how dangerous does it get? I'm not a total coward and i could handle the heights of the Atlas mountains but if there was any way of avoiding the hairy bits on the 'dream way' i would probably do that. i know that may be frowned upon and my feelings may change when i got there but it does make me feel anxious.Have told some of my mates about your blog as well,hope it's going well for you. You do need a head for hieghts on the Dreamway. Not good if you suffer from vertigo. The cables actually help! Enjoy Portugal and then head for the Alps. My friend and I will be hiking the 2 trails beginning on April 15th ending on the 26th. We are starting in Santigao Do Cacem, heading west to Porto Covo and then south to Cabo De S Vincente. Looks like there are not any accommodations in Cabo, so we thought we would take a cab (?) to Sagres spend the night and head to Lisbon via bus (?). We would appreciate any thoughts on this approach. Also, we would love suggestions for accommodations in Lisbon...so many options! Weather? We were planning high 50's (F) to low 60's (F).....hiking tights and long sleeves...looks like you are wearing shorts?? Thanks for your help! Looking forward to a beautiful trip. I did a circular walk from Vila do Bospo on my last day and then got went to Faro via taxi and train. Lots of flights to the UK from Faro and it's a bit closer to the end of the walk than Lisbon. I use a web site called Rome2Rio to help me with my plan my transfers. It's usually right and it says there is a one a day bus to Lisbon from Sagres, takes 5 hours but the buses are usually very comfortable. I haven't stayed in Lisbon but a friend, who is also walking the Rota in April and usually does a lot of research on these things, is staying at the Browns Hotel so that might be worth a look. Unless you're very unlucky you will not need hiking tights. I did my trip in March and the weather was lovely. In April it should be perfect with all the flowers out. My wife went swimming! By the way if you see a couple of people on bikes it could be us. 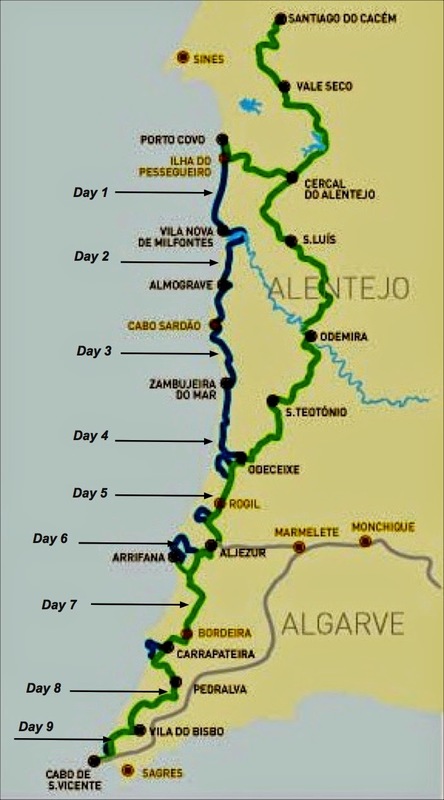 We're heading south from Lisbon from the 15th and cycling round the coast to Seville. thank you for sharing your great experience! We are a couple with a 2 years young boy and love hiking. We live in the Alps and are used to all kind of mountain-trails :) We are thinking how about if we would walk along the Rota Vicentina next spring or autumn with our boy. We have not yet done long distance walking with our boy (alone yes). What are your recommandations for us in general? Thank you in advance and best regards from Northern Italy. Sounds like you need somewhere with reliable weather early or late in the year which makes the Rota Vicentina a good bet. The best hiking is definitely the first part, the "the Fisherman's Trail" and once you get past that things get a little bit dull. The other hike you might want to think about is the GR7 in the Sierra Nevada. It's a bit tougher than the Fisherman's Trail but with nice places to stay. There are two routes - one goes to the north and other to the south. 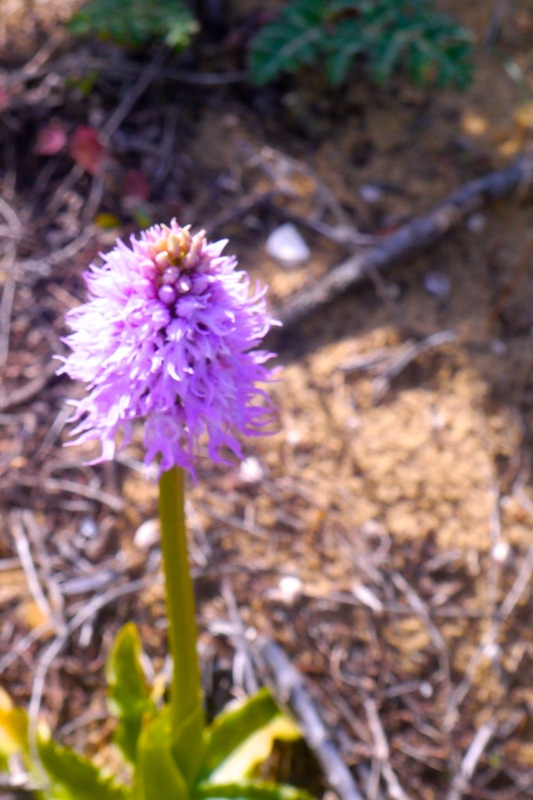 The southern variant is nearly always dry with great walking in the spring or autumn. Do you think this trail will be suitable to hike with a dog? It looks like the toughness will be ok, but i'm particularly interested in the presence of stray dogs and/or guardian dogs, which might pose a 'risk' when not socialised. I think it will be fine. I don't recall seeing any guardian dogs although I did see a sheep dog on the last day. Perhaps you could send a note to the official website if you still have concerns. Hi John, thanks for the blogpost about the Rota Vincentina! I could use the information well for my hike in October/November this year. I have now published a list of budget accomodation on my blog and will follow up with a story (in German though) soon. Maybe it's interesting for you! Thanks for the tips John. Thinking of doing your route in the second half of June with my son - will it be too hot do you think? It is starting to warm in June. You can expect daytime temperatures in the mid to late twenties and there is a risk that they might go higher. Hi -- quick question: Did you book all your accommodation in advance? Hi John, thanks for a great article. We've just booked for departure on 1 March, but I haven't planned my itinerary yet, so it's a massive help. Are there shops for food and water regularly along the route? Can you get packed lunches at the accommodation? Based on the terrain, what's the max number of miles/KMs you'd recommend per day? We're regular/fit walkers, and want a workout, but also want to enjoy the route, etc. It's not hard walking, very little in terms of climbs, so 20km days are OK. Most of the places have bakeries where you can get the stuff for a picnic and on several of the stages you'll places to stop on the way. The first half of the walk is the best so I would spend more time on that than the second half. Thank you for being such a great resource. I am going in May. Do you think I will need rain gear? I'm a bit of a wimp when it comes to heights. Not keen on narrow paths cut into cliff faces for instance. But OK on cliff top paths. The official website for the Fisherman's Trail says "NOT RECOMMENDED FOR PEOPLE WITH VERTIGO OR FEAR OF HEIGHTS". But so far as I can see on Google maps, the cliff top paths look wide and mostly away from the edges. Is this the case or are there some hairy sections I'm missing. We made a post about our experience as well. There are some more photos for everyone to enjoy! Vila Nova de Milfontes probably has the best combination of nice ambience, places to hang out and things to do on a day's relaxation. Most people go from north to south so they can finish at the lighthouse but you can of course go either way. The best walking is at the northern end. Have you ever done a hike in Norway/Sweden? My girlfriend and I want to do a similar hike to this one in Portugal, hiking all day and staying in local accommodations each night. Carrying our belongings in our packs (no sherpa). Any experiences like this? We would like about 150 miles. Thank you for sharing about this trip. I actually refer to your site before i start my journey everyday during my RV trip in Nov. It was my first trip and i am not an experienced hiker at all. I was wondering if you could recommend me any trail similar like RV in Europe in November? Hi John! I host the Active Travel Adventures podcast and I have an episode coming out next Thursday on the Rota Vincentina. You have some beautiful photos and I wondered if I might use some of them on the corresponding website with credit to you of course, and a link to this blog post? Hi John. Just wanted to thank you for this detailed.blog. I'm starting the trip 20th of February, probably going north-south from Porto Covo- am really excited. Thanks again. No problem. A couple of your links aren't working, you might just want to check them. Thanks, John! I'm not sure what 'ate' my links, but I just redid everything and it appears to be working properly now. I'm going to try to get over there to walk the Fisherman's Trail myself in the next couple of months. Hi John. I was thinking about skipping Aljezur and going straight to Arrifana from Odeceixe. Do you think this is overly ambitious assuming that conditions are good that day? None of the conditions are technically difficult, there are no serious climbs, so the only issue is whether or not you're comfortable with the distance. There are shortcut options as well between Arrifana and Aljezur. Can you say how much meals and accomodation cost on your hike? Hi John! Do you think it could be appropriate to do this trip on august? Do you know if there are some organized-group we could join? great read! I'm starting the route in about two, on the very same date you did! funny coincidence! 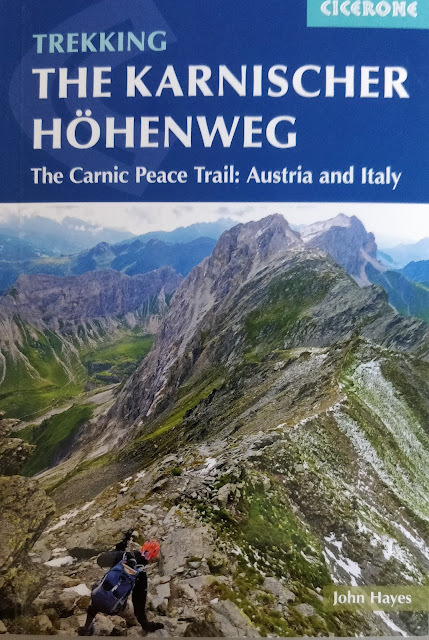 Anyhow, I'm a gal walking solo and plan to wildcamp, and though have crossed Europe by bike before, I'm new to walking and wonder if the trail is safe and all that good stuff. Also, hiw easy is it to find grpcery stores along the way? Thx! I'm not a wild camper myself but yes there are plenty of places to buy food along the way, the schedule is basically town to town. It's a popular route, you will see other walkers and I think it's safe. It's low season in terms of holiday makers but bang on the nail in terms of walking, good time to go and you should be seeing both the spring flowers and some walkers. Have a great trip. Hi Catherine, the signs are excellent so you won't get lost, keep the sea on the right!